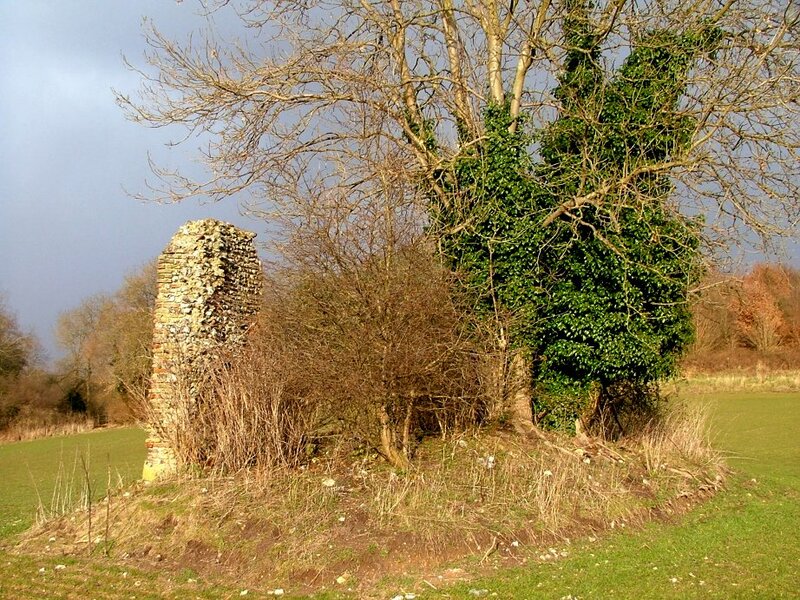 It was towards late afternoon on a bright, crisp, blustery day in early March, and we were driving very slowly along a narrow lane through the woods and meadows east of Lyng, looking for a ruin. The road undulated wildly, and it was hard to see beyond the hedges. All we knew was that something survived. Pevsner reports an arch, but he saw it in the 1950s, and it was unlikely to have been checked for the later editions, I thought. We didn't know how far off the road the ruin was, or even exactly which side. Long sheets of grey cloud swept in quickly from the north, carried on the back of the biting wind. As we came to the top of the next rise, it started to snow. To be honest, my hopes weren't high. There was a bridleway through the woods, and we parked in the mouth of it, for the simple reason that there was nowhere else to park. We got out into the full force of the blizzard, and quickly got back into the car again - there was no point tramping across the countryside if we couldn't even see what we were looking for. Eventually, the feathery gusts subsided, and we could stand on the road and look around. The snow hadn't settled. On the far side of the lane was a wide, undulating field leading down to the infant Wensum winding along the bottom. The field was a sea of vivid green shoots, barley perhaps, but out in the middle floated a little island, a tree with a copse beside it. 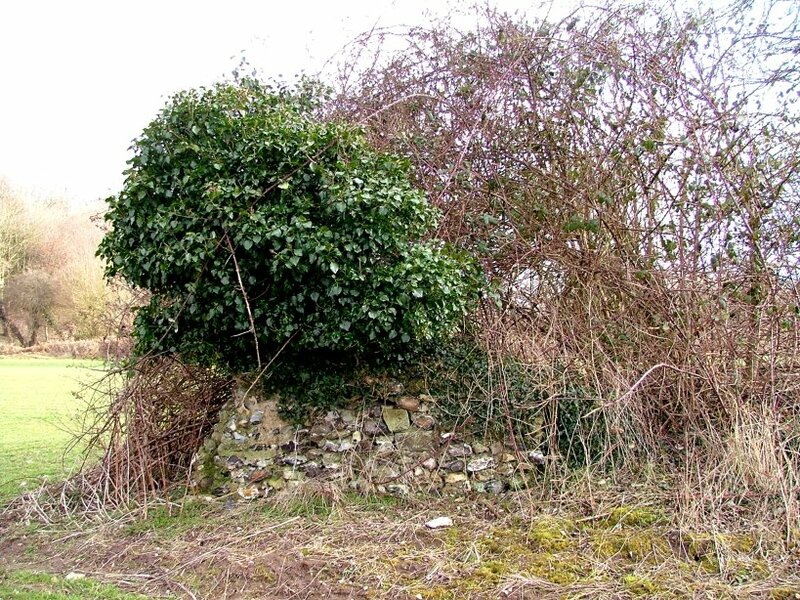 It could have been a barrow, or an old marl-pit. It could have been anything, but we had no better ideas and so we set off towards it. As we walked, I was trying to make sense of the shape, and perhaps to make out a detail that might suggest it was what we were looking for. I knew that Peter was too, and as it turned out he saw it first - "look, there's a wall of flint behind the tree!" he shouted above the wind. I couldn't see it. I wanted to, but the icy blast in my eyes made focusing difficult. We headed on, and then I saw it, or thought I did. And then I was sure. By now, Peter had lost sight of what he'd seen, and he was apologising, saying that he must have been mistaken, but I was saying "no, look, there it is, beyond the tree!" And then we were there. If there was ever a surviving arch, it has gone now. 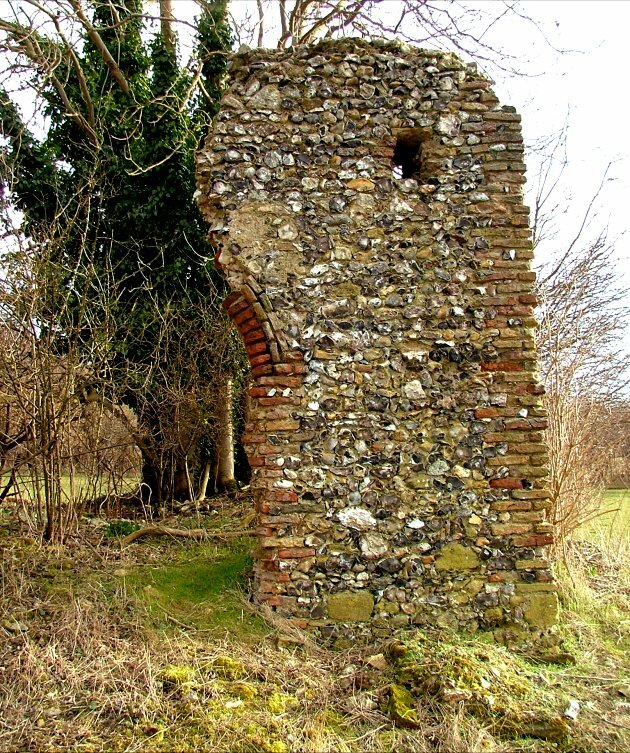 It must have been the north doorway, because the red-brick outline of the western side survives in an outcrop of flint wall about three metres tall. It is directly behind the tree, and must be invisible in Summer. 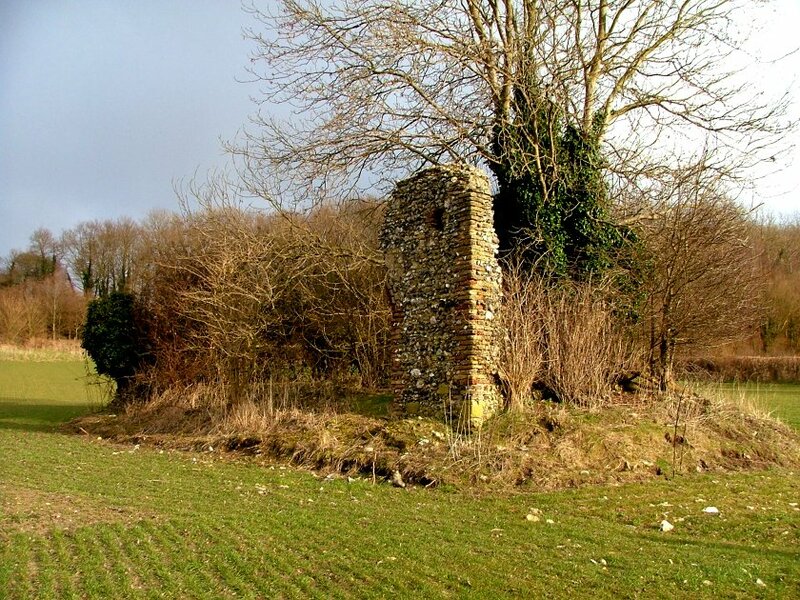 Just beyond the surviving fragment of archway, to the west, is a brick corner, and so I think that this must have been a towerless church. All around us in the field were scattered thousands of tiny flint fragments, spread from the ruin by centuries of ploughing. They lie up to about ten metres from the mound, thinning out as you get further away, until they become indistinguishable from the normal flintiness of Norfolk soil. We climbed inside the ruin, but there was nothing else to see. 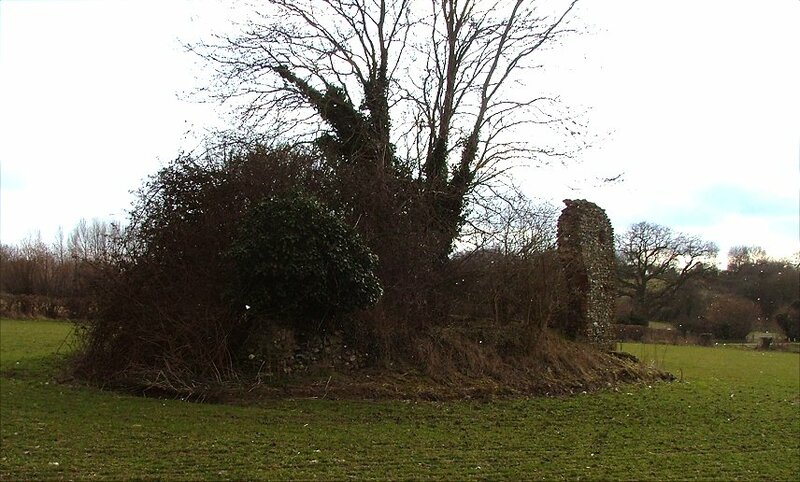 Hardly anything survives of Lyng's former second church. Peter, who is still living in the pre-digital age, used the last of his film in recording it. We felt pleased with ourselves, and wandered carelessly along the northern side of the mound imagining what it must once have been like. 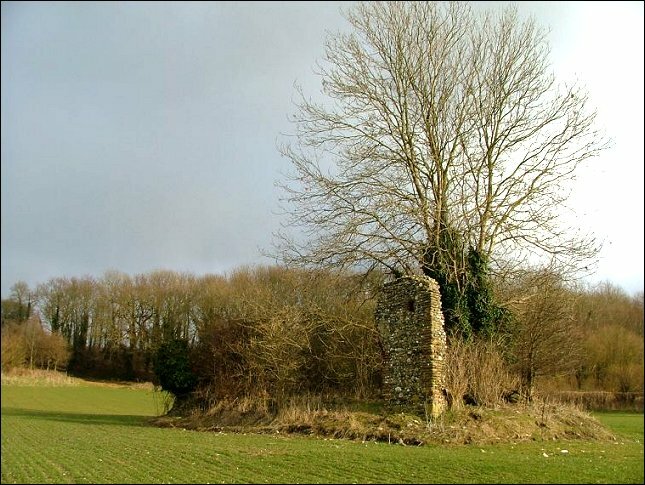 Just as we got to the east end of the copse, we saw another outcrop of flint, the lower part of what must have been the north chancel wall. "Just as well you don't need to record everything", I joked, "otherwise you'd need to go back to the car to get a new film!" But Peter didn't answer. 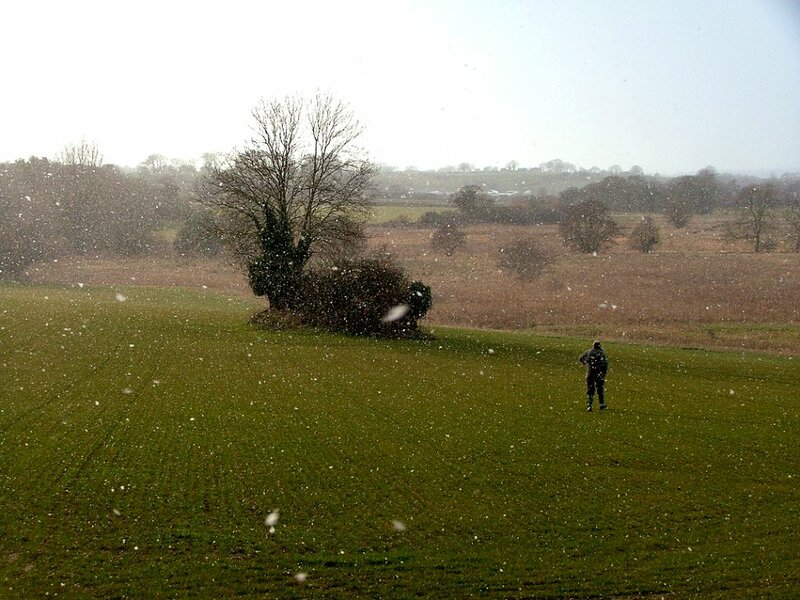 He was already striding back across the field to his car, the snow starting to fall heavily again as he went for another film. I wrapped my jacket around myself and followed him, and then stood on the edge of the field and watched as he headed back into the blizzard, towards a church that was barely there. I admired his determination, his attention to detail. It was a journey which I was sure Pevsner's revising editors had never made.